a device for mounting and securing workpieces or cutting tools in metal-cutting or woodcutting machines. 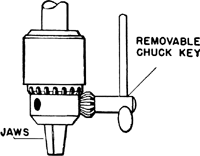 Chucks may be mechanical, pneumatic, electromagnetic, or hydraulic in operation. The most commonly used is the mechanical self-centering three-jawed lathe chuck, designed for holding regularly shaped workpieces (primarily bodies of revolution) and centering them on the lathe spindle axis. The gripping action of self-centering chucks results from rotation of a spiral-grooved plate in which the bottom surfaces of the chuck jaws are seated, causing a simultaneous, radial movement of the jaws. A four-jawed lathe chuck is used for clamping irregularly shaped workpieces; its jaws travel radially and independently of each other. Fast-acting collet chucks are used for gripping small-diameter cylindrical workpieces on turret lathes and semiautomatic machines. Pneumatic and hydraulic chucks permit rapid gripping of the workpiece and freeing of the machined part. Electromagnetic chucks are used mainly for securing thin parts that can be deformed when clamped in chucks of other types. A device for holding a component of an instrument rigid, usually by means of adjustable jaws or set screws, such as the workpiece in a metalworking or woodworking machine, or the stylus or needle of a phonograph pickup. A small bar between flask bars to secure the sand in the upper box (cope) of a flask. A device with adjustable jaws used for centering and holding a cutting bit, drill bit, etc.